Nonprescription analgesic drugs, sometimes called nonsteroidal anti-inflammatory drugs (NSAIDs), sold singly or in combinations, have the potential to cause kidney failure, when taken long term. Examples are Advil, Aleve, Alka-Seltzer, aspirin, BC Powder, Ecotrin, Excedrin, ibuprofen, Motrin, Tylenol, Vanquish, and many others. Combination drugs seem to be especially dangerous. NSAIDs are probably the most widely used drugs in the United States, but no one knows for sure how many patients with chronic kidney failure got there because of these drugs. If you must take medication for chronic pain, don't take it for more than a few days at a time. Anyone taking these drugs for more than a week at a time should check their urine for protein at least once a month as described in Chapter 3. If there is protein in your urine, stop the drugs immediately and check again after a week or two. If protein persists, see your doctor. There is a group of patients whose renal disease is clearly caused by nonsteroidal inflammatory drugs. Analgesic abuse of this kind is much more common outside the United States (particularly in Switzerland and Australia). It follows years of near-daily ingestion of analgesics, usually two or more. Withdrawal of analgesics may reverse this kind of renal failure, but usually not if the failure is more advanced. Lithium is widely used for the treatment of bipolar disorder. When it damages the kidneys (which it can do if the level of lithium in the blood gets too high), urine flow increases (sometimes to over a gallon a day). Protein may not appear in the urine at the early stages. Blood creatinine concentration will rise. Alternative medications, such as valproic acid, are available for the treatment of bipolar disorder, but may damage the liver. Dieter Bacchus was an employee of city government. 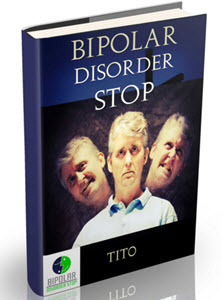 He developed bipolar disorder at the age of 21 and was started on lithium at age 24. His lithium and creatinine levels were checked regularly. By age 35, his serum creatinine concentration was noted as above normal, 1.8 mg per dl (normal is less than 1.5 mg per dl). By age 40, two glomerular filtration rate (GFR) determinations were 5.2 and 9.0 ml per min (normal is more than 100 ml per min). His lithium dosage was finally reduced, and by 1989 his GFR increased to 41.5 ml per min. He had no symptoms except that he had noted huge urinary volumes (8 liters a day) and also increased thirst. Urinalysis was negative. He replaced lithium with valproate, which successfully controlled his manic episodes, but excessive water intake and large urinary volumes (6 to 8 liters daily) persisted. I advised him to start hydrochlorothiazde, a diuretic drug that, paradoxically, acts like antidiuretic hormone (weakly) and therefore reduces urine volume when the urine is very dilute, despite increasing salt excretion. He was not otherwise treated. Daily urine output decreased somewhat (to 4 to 6 liters per day). Kidney function remained constant for five years. Then it began to decline, for unknown reasons, in association with an increase in average urinary protein excretion from 438 mg per day to 2,545 mg per day. Eventually his GFR fell to19.6 ml per min, and he was started on keto-conazole plus low-dose prednisone (see Chapter 16). A year later GFR was unchanged, indicating that the decline in GFR has been arrested. He has so far declined to follow a low-protein diet. When the outflow of urine from the body is partially obstructed, either as the urine flows from the kidneys to the bladder or out from the bladder via the urethra, back pressure may build up in the kidneys. This back pressure may distort the shape of the kidneys and diminish their function. This condition is called hydronephrosis. In some cases, complete urinary tract obstruction can develop and acute renal failure may occur. More commonly renal failure is only partial. By far the most common cause of urinary tract obstruction is enlargement of the prostate in men, but there are many other causes in women as well. When the obstruction is relieved, in most cases the kidneys have an amazing ability to recover from this damage, but the obstruction must first be recognized. A sono-gram of the kidneys and bladder will quickly reveal any obstruction. Surgery may be needed to relieve the obstruction. Urologists treat this type of kidney failure. Another urological problem arises in people whose childhood medical history includes difficulties with urinary drainage, especially reflux of urine from the bladder up the ureters into the kidneys during voiding. 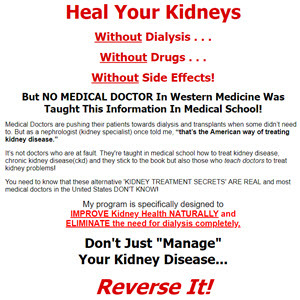 The multiple corrective operations that are needed may cause kidney failure. Mostly these patients are males. They may start to show signs of kidney disease in their 20s or earlier. It is best detected by measuring creatinine in the blood. Eventually they may progress to end-stage kidney failure.